This is a great time for Music Educators/Musicians to “get in” on some great music realted “freebies” …just in time for the holiday season! As you know MusTech.Net has been giving away FREE iSchoolBand.Com subscriptions to k-12 music educators (The next batch will be going out this coming Monday …and there are still some left!) 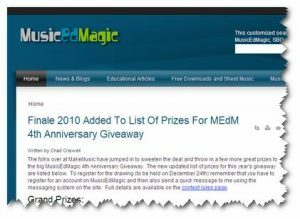 AND… there are some other great FREEBIES to be had as well at MusicEdMagic.com! Chad has a great site with MusicEd.Magic.com and I encourage you all to check it out regardless of whether or not you enter his contest. It is a great resource for any musician, especially Music Educators! Click this link to go directly to the contest information.